The United States Environmental Protection Agency (EPA) characterizes the wastes generated during the exploration, development, and production of crude oil, natural gas, and geothermal energy as “special wastes” that are exempt from federal hazardous waste regulations. This study is based on a landfill in the state of Louisiana permitted to dispose four types of exploration and production (E&P) wastes. Due to the nature of some E&P wastes received at the landfill, a solidification agent, usually sawdust, is added and mixed prior to final disposal. E&P wastes can have an impact on the slope stability of landfills due to their distinct shear strengths and the concern of development of additional pore pressures due to the reduction of the hydraulic conductivities caused by the utilization of some solidification agents (e.g., sawdust). 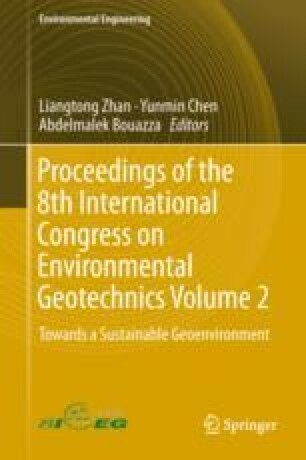 From this study, the authors developed the necessary geotechnical parameters to conduct a slope stability analysis for the design of future disposal cells and proposed general operational and monitoring guidance concerning the expansion of the landfill. One of the main conclusions of the study was that even though the utilization of sawdust/E&P waste (water-based) may improve the shear strength of the total waste mass, the development of inexorable pore pressures may reduce the safety factor of the landfill slopes.